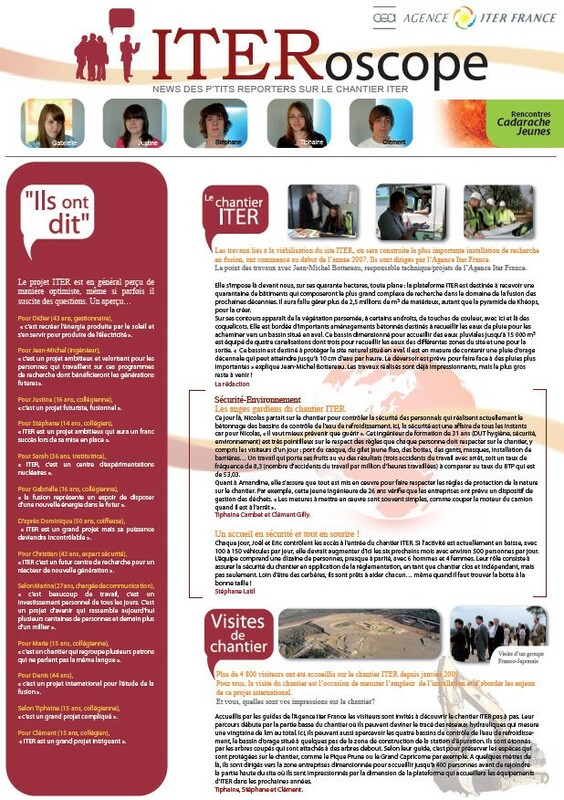 Last week, Gabrielle, Justine, Stéphane, Tiphaine and Clément, junior high school students from five different local establishments, stepped into journalist's shoes, or, to be more precise—hardhats and boots—for two days on the ITER worksite. While Gabrielle and Justine managed the cameras, reporters Stéphane, Tiphaine and Clément performed interviews, asked questions, and learned about the work-in-progress, all with a full dose of enthusiasm and humour. The result is a two-page ITERoscope newspaper with articles, photos, and—thanks to the help of Sylvie André from Agence Iter France—a professional layout. Altogether a professional job! The reporter training was part of the 14th CEA-Cadarache Youth Day (Rencontres Cadarache Jeunes), in which 200 junior high school students and their professors from nearby schools were invited to spend a day at CEA Cadarache. ITERoscope was distributed to all at the end of the day; a souvenir from ITER that will be shared with families and schoolmates.